When something new comes out in the computing market, people tend to always look out for “revolutionary” features – something radically different from what was had or experienced in the past. When talking about fundamentals, Microsoft evidently went seriously this time around with its latest release, Windows 8. The new product contains functionalities and features too compelling and incomparable that people would think that this isn’t a Windows reiteration they’re dealing with anymore, but rather an all-new operating system. Here are some of them. Windows OS sheds the beveled, shiny look it had for ages with the new Windows 8. The altered appearance of the latest OS features a minimal, simplified look, which completely departs from the glass-like, Web 2.0-ish look of previous releases. Users can expect this subdued UI to draw more attention to function and content over a mash-up of effects and extra elements the public has come to identify with Microsoft. Windows 8’s lock screen, evidently patterned after the Windows Phone lock screen, sports better visuals: a beautiful picture plus a few widgets that don’t give everything away (essentially, your PC or lappy is still on its “locked” state). Touchscreen users can swipe up to unlock while desktop or keyboard users can just hit the spacebar to proceed to type their passwords. There are other advanced means of unlocking optimized for touch-enabled Windows 8 machines, like drawing invisible gestures or using photos as references to go into your system. Windows 8 streamlines yet another essential feature: the Task Manager. The new Task Manager is optimized for completing common tasks such as killing apps and processes through a functional interface in which both basic and power users would surely benefit. For the basic users, gone are the tabs, the menu bar, and the statistics that provide unneeded information; only the running (or unresponsive) applications remain. The advanced users, meanwhile, can access more vital on-goings within their system by clicking the “More details” button on Task Manager, which reveals a familiar tabbed view (albeit the regrouped information) of all your processes. 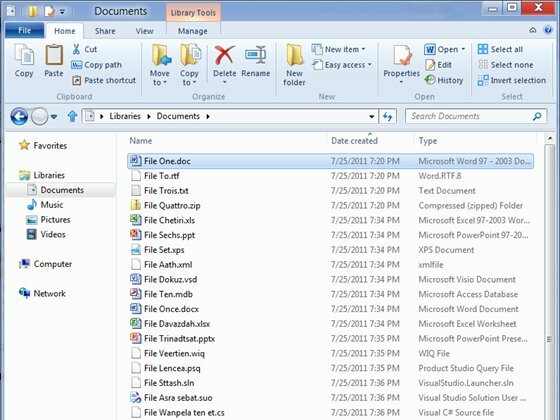 On Windows 8, expect to see an “upgraded” Windows Explorer patterned after the Ribbon interface first introduced in Microsoft Office 2007. Instead of toolbars and menus, you’ll find Ribbon panes like Home, Share, View, and Manage. If you’re exploring a special folder designated for a certain file type like the “Music” library, for instance, you’ll get additional Ribbon panes for common tasks like playing a file, playing all files, and adding files to a playlist. In addition, Windows Explorer in Windows 8 now offers native mounting of ISO files and marks the return go-up-one-folder button featured in XP back in the day. For the first time in Windows OS history, Microsoft throws in antivirus software to Windows 8’s Windows Defender so you won’t need to get third-party antivirus software from the likes of McAfee or Norton, thus saving you a lot of money. Early evaluations reveal, however, that the antivirus function isn’t as efficient as those from trusted antivirus suites whose detection rates go as high as 99.9 percent, so it’s still advisable to use third-party options. Say, give Microsoft’s antivirus feature to mature in a year or so. Windows 8 incorporates native support for USB 3.0, meaning they will work with any generic USB 3.0 controllers without having to install device drivers that are manufacturer-supplied. This shouldn’t be surprising as many new computers have integrated USB 3.0 support into their chipsets due to the revised connectivity standard’s faster data transfer speeds and seamlessly reliable performance. 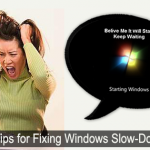 People are so accustomed to “resetting” OS installations over time, and Microsoft perfectly understands this need. Thus, the introduction of Windows 8 Refresh, a feature which lets restores your Windows 8 installation to an earlier, cleaner state without having to reinsert your installation media. If reselling your machines or devices after a while is your thing (perhaps for to upgrade or to satiate your wallet), then this feature would make you all giddy. 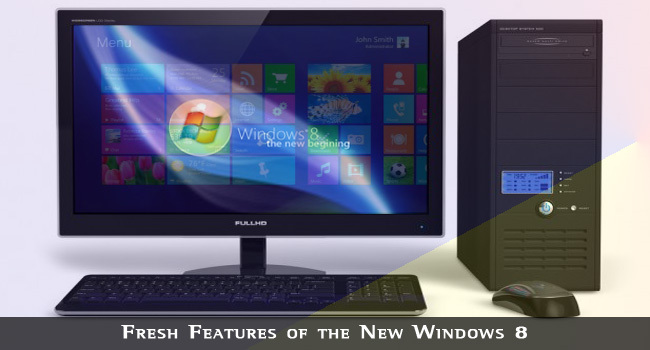 Do you know any other fresh features of Windows 8, don’t forget to share it with us in form of comments below. I love this interface. Totally new and revolutionary. Nice to see all notifications on start page. Yeah it’s good to see all notifications on start page. When my friend first showed me Windows 8, I was not impressed with its completely new interface which is mainly focused on mobile and tablet devices. But I agree that bootup time is super fast. But I feel very uncomfy without the start button. Yeah, there main focus is touch screen devices, and there are many tutorials on the net to get back Start button. I appreciate the information. I’m not real computer savvy, so any information like this helps! I will pass this article through all my social medias. Thank you! Thanks Pepper for sharing the article, I appreciate your support. I really liked the new Windows 8 interface , it is modern and efficient. Due to the graphical interface changes the performance is also improved a lot. Yeah new Windows8 interface is cool and performance is very good, everyone is happy with improved performance. Cool features I must say!…I always prefer the simpler version of OS in my phones and also I prefer them to be more attractive….I keep refreshing my OS from time to time, so the cleaner OS refresh and restore is an important feature, atleast for me…. A nice round up of the windows 8 features. really liked it. Microsoft made many changes to Windows 8 other than UI. And personally I liked the boot up time. Its very fast. Yeah many things changed in Windows 8, and I agree boot time is very fast. I totally love these new Windows 8 features. Anyway, the best feature I believe is the faster boot time! Haha… I don’t mind forking out $200 for this feature alone! Yeah I agree with you..,Windows 8 have better multiple monitor support,It support ARM architecture and any many other features are included in Windows 8. Nice Review.I agree with you on MSE .In windows 8 MSE is bundled but there are lot of third party free applications with better detection rate than MSE. On a recent review from AV Test Institute the anti virus solution in Windows 8 scored 11.5 out of 18….Not bad. I’ve heard from some that the built in anti-virus really helps speed up the PC as opposed to using an external anti-virus solution, which sometimes can cause your computer to run more slowly. I really like windows 8 because it contains lots of new features and functionalities to access system smoothly. I too like the boot time. But when it was launched it came without a “start” button, i think that really put off alot of people. Bad move MS!